Mission: Impossible – Rogue Nation is the fifth installment in the Mission: Impossible series with all the usual suspects: Tom Cruise as agent Ethan Hunt, his partners Ving Rhames, Simon Pegg and Jeremy Renner, a beautiful woman (Rebecca Ferguson) and a lot of brands. Let’s check the most obvious product placement from the movie. 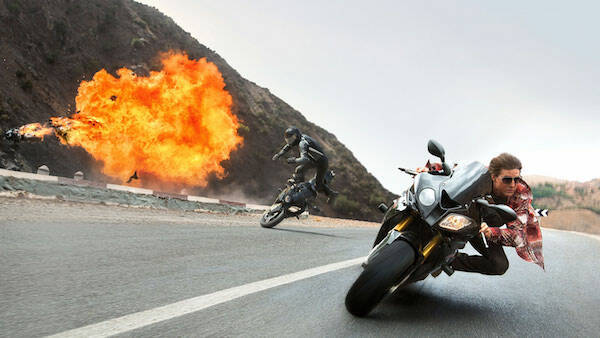 BMW had been involved in the previous installment of M:I – Ghost Protocol and returned in Rogue Nation with one car (BMW M3) and S 1000 RR motorcycle. Brandchannel asked Claudia Müller, Head of Global Entertainment Marketing for BMW Group, what makes BMW a fit for the franchise, and how is BMW’s involvement in Rogue Nation different from its role in Ghost Protocol. I have dedicated a special blog post on L.G.R sunglasses in Rogue Nation. Cruise wore two models: Comoros and Tangeri. Simon Pegg wore Tissot’s T-Touch Expert Solar Men’s Quartz Chronograph Black Dial watch. Almost all members of IMF use a Windows phone. In one see Simon Pegg uses three Dell monitors to play Halo 5 game and then makes a call using Cisco system. If you’re really interested in brands from Mission: Impossible then you should check blog posts L.G.R sunglasses in Mission: Impossible – Rogue Nation and Product placement in pictures: Mission Impossible – Ghost Protocol. I wonder what is eyegelasss barnd name that solomon lane wears in MI rougue nation. Does anyone here know where I can get the glasses worn by Solomon Lane in MI: Rouge Nation? Gucci 2250 the model of glasses worn by Solomon lane. What brand/model of headphones does Benji use while at his desk in the office? Solomon Lane is actually wearing Mykita brand frames. I happen to own a new pair of monty- style frames and so this was very obvious to me. I can tell this by the clear ear bands, and the screwless hinges. They are hand-crafted in Berlin. Hi! Maybe someone know the model or the brand of the hooded leather jacket of the bad guy Janik Vinter? It appears in the finals night scene. What about Ving Rhames’ wonderful collection of fedoras? Carrying a hat collection around the globe like that, talk about a Mission Impossible! The headphones Simon Pegg is wearing, what brand is that? And What a out the shoes of ger? Does anyone recognise the brand name silver tube of lipstick that the female actress uses to give to Tom Cruise and that he later finds that it is a thumb drive? Just wondering about the brand and color? It looks like Clinique. When we talk about fashion, the thing that instantly come in our mind is styling with jackets. As the usage of jackets is getting increased in Hollywood demands of the jackets is being increased for normal daily routine as well. We as a maker of FAMOUS MOVIE JACKETS brought to you a wide range of fine quality of jackets in leather, cotton and satin. Our versatility includes Movie Jackets, Celebrity inspired jackets, Super heroes jackets and biker jackets for men and women. Shop now http://www.famousmoviejackets.com and enjoy amazing fashionable outfits in reasonable prices. "Seeing Tom Cruise wearing L.G.R sunglasses is a dream come true"